A curiosity whenever attending a gathering of industry leaders like this is always: what’s the latest innovation? At the Sustainable Apparel Coalition conference, it was encouraging to see that innovation went far beyond interesting technology (though there was that too!). A panel of entrepreneurs from the Fashion for Good program presented several technologies that promise to make apparel fabrics or manufacturing more environmentally friendly. Most interesting were advances in fabric dyeing – from a black pigment made from wood scraps to a system to pre-treat cotton to use less resources later in the dyeing process – and in recycling clothes – like a water-based way to break down clothing into pulp to be spun into new fibers. An encouraging theme was that many of these innovators have already gone through lab and prototyping stages and are now market-ready. A presentation from once-startup now-growing Bolt Threads called to attention the need to go beyond technology. The Silicon Valley darling was originally known for their “spider silk” material. However when asked about the their success – which includes over $200M investment – VP of Product Development Jamie Bainbridge pointed to the fact that their team includes marketers alongside PhDs to bring the product to market. In particular, their partnership with Stella Mccartney on a silk dress, on display at the Museum of Modern Art, showed other brands how an innovative fabric can be cutting-edge fashionable as much as cutting-edge sustainable. 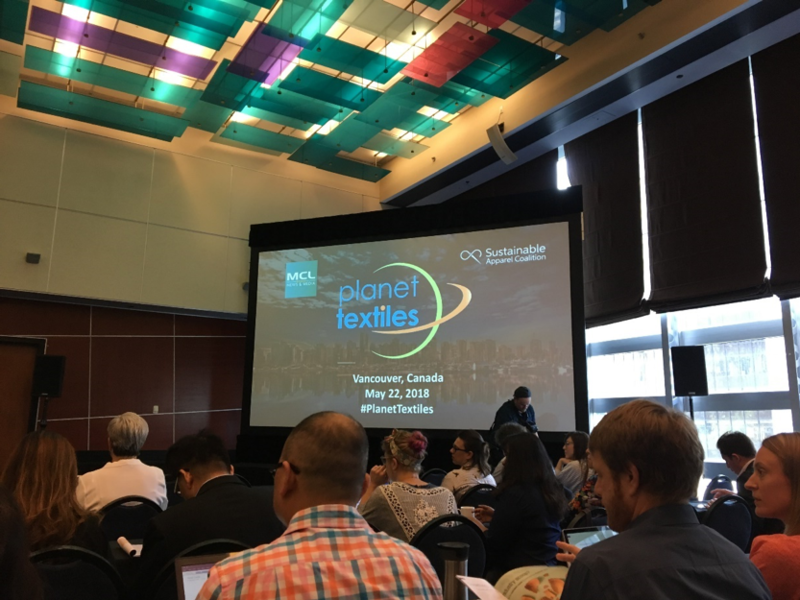 The Planet Textiles opening remarks by Kate Heiny, Head of Global Sustainability at C&A, highlighted the importance of tailoring sustainability efforts to the DNA of a brand. When the European fast fashion retailer sought out to make a more sustainable t-shirt, “a €40 shirt wouldn’t work” said Heiny, as the company mission is to bring affordable fashion to the masses. So the company, already the world’s largest buyer of organic cotton, worked closely for years with Cradle2Cradle and its suppliers on all aspects of the t-shirt from fabric to colors to thread. The end result was a C2C Gold certified t-shirt which can be composted in a matter of weeks. Sold for €7-9. Another positive development shared at the summit was at a panel on financial innovation for sustainability. Upgrading large manufacturing processes to become more sustainable is not a cheap effort. Companies, especially smaller suppliers, often need help and incentives to make the investment. HSBC shared several programs to finance sustainability in fashion – from green lending to the first of its kind “SDG bond,” a way for investors to finance global sustainable development goals. IFC, a division of the World Bank, shared other ways available to supply chains, particularly for manufacturers in developing markets. For example, beyond direct loans, IFC leans on corporate guarantees to offer suppliers a lower interest rate if they are working with a larger brand, as it did in Bangladesh to improve fire safety for VF suppliers. While there were many more collaborations to report on, a common theme throughout the conference was that, in the shared challenge of sustainability, no one is working alone.